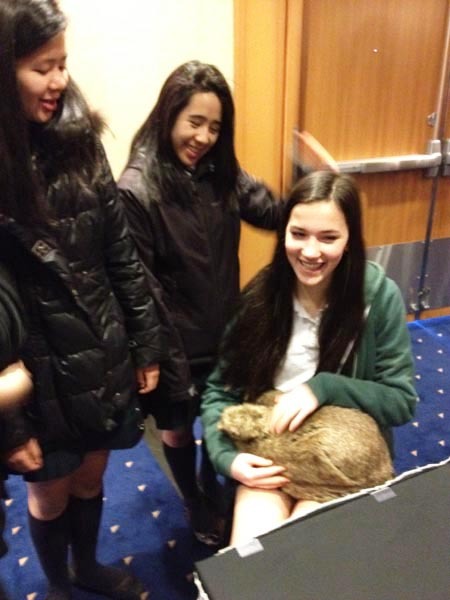 On Wednesday March 7 the Programming class attended the Haptics Symposium at the Sheraton Hotel. This was a conference for computer programmers, engineers and designers, focusing on interactive touch technology and practical applications. There was an array of demonstrations and products. 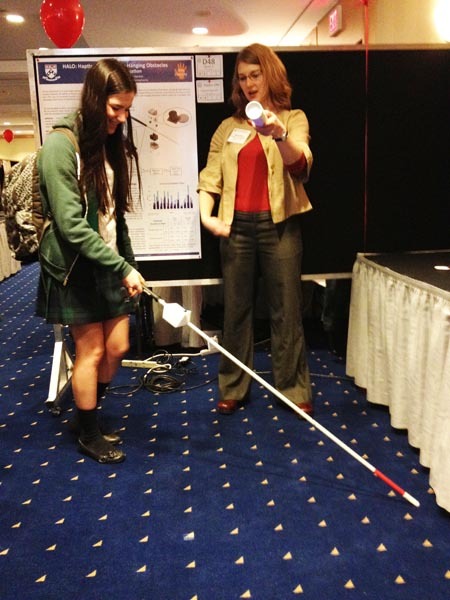 From a walking stick for the blind that detects heights, touch sensitive video games, robot “pets’ to quell anxiety and drill training for dentists. 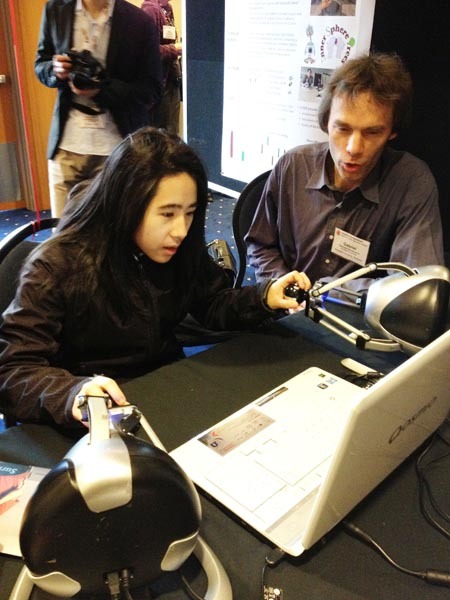 I had a lot of fun attending the Haptics conference. I learned a lot of things that I didn’t know before, such as the fact that technology can be used in everyday life (e.g. the walking stick with the sensor). There were also a lot of cool things, such as the demo with vibrations from marbles in a cup. It was a really amazing experience, so thank you very much! I have to say it was the best field trip yet. Before this field trip, I didn’t even know what haptic was. The third invention I saw blew me away. It was an invention called the Haptic Tool Set (I think). It was about how people can transfer what they are feeling through sound waves. The basic idea was that when something moves, it makes a sound. When the inventor lowered the frequency of the sound waves this way, we can feel the vibration but not hear it. This is amazing because we can do so much with it in the future. In the future, people will never have to say “you know that feeling when…” because we can just send them what we are feeling. There were also inventions related to health. The one about practice for dental student was just the right thing. In the future, patients will never have to suffer unnecessary pain. So many cool inventions! I never knew that programming can do so awesome things. Overall, I really enjoyed the fieldtrip! Some of my favorite demonstrations were the fluffy animal that had the potential to calm people down, as well as the cup and dentistry demonstrations. I felt like it would have been interesting to learn if these products were ever going to come out on the market, and what other applications of them could be. 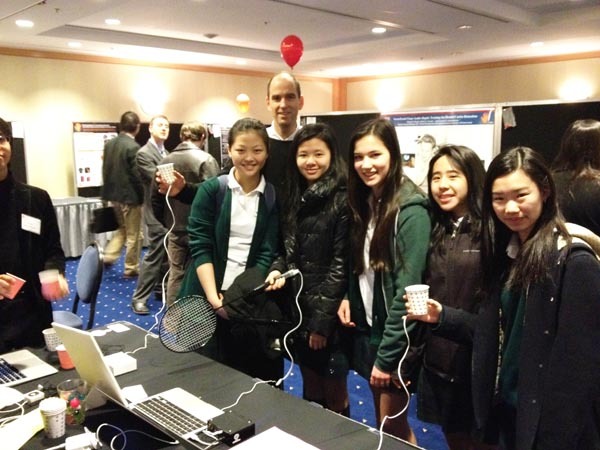 It was a great experience, and I was amazed at the ingenuity of the inventors! Thanks! 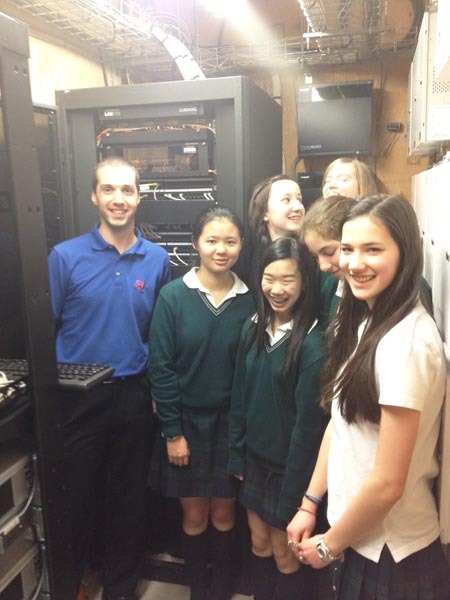 As part of their unit on networks, the Computer Programming 11 and 12 class had a tour of York House Schools network and server systems. They looked at the firewall, phone, security, network and server systems including how they are linked to the new portables. Next PostNext Dissecting for Fun & Food? !